Mon, April 19, 2010: First version, with photos. 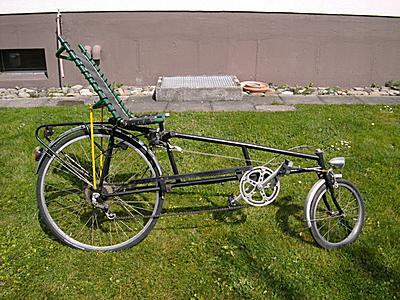 I've got from a friend this "Roulandt" longrider (photo below), variant of the Avatar 2000 or Fateba. I couldn't first make out what brand it was, fortunatly Markus Haenni from Fateba.ch recognized it and determined that it's a "Roulandt" recumbent with a Fateba seat. The frame number reveals very likely the year, 1983. Unfortunately the wheel in the back is a single chamber rim and simple spokes - with baggage and rough street not suitable. 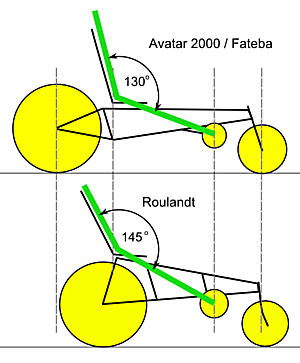 The illustration shows the frame difference, the Avatar 2000 / Fateba has a lower seat, and is longer than the Roulandt. Lower seat means easier to halt and keep balance, and lower fall-height in case of accidents. 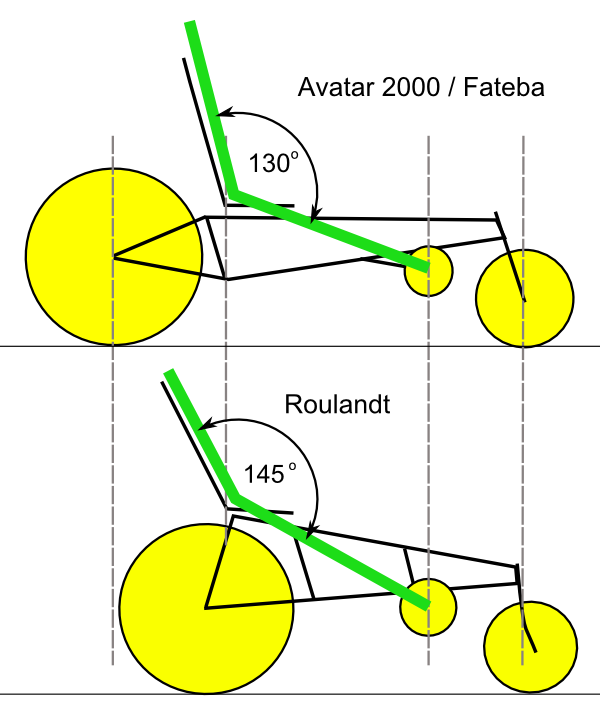 The distance of seat to pedals are the same for the same person of course, the distance of the wheels is shorter for the Roulandt, allows riding smaller radius but also less stable at higher speeds. The back wheel are both 28", whereas the Fateba has a 17" front wheel, and Roulandt a 16". Small(er) wheels means higher tire usage for the same distance covered. The previous owner replaced the original plastic seat, which was not good and broke quickly as I was told, with a solid Fateba seat.